At our 20th Annual Open day we held a Charity Raffle in aid of Marie Cure Cancer care. 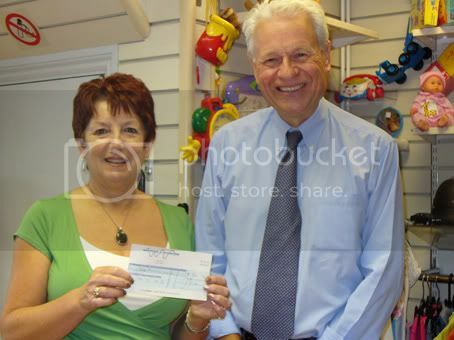 We collected a total of £320 which Jeff Stanton presented to the local organizer as shown in our picture. We would like to thank all those visitors who bought a ticket to support such a worthy cause. The Radio Society of Great Britain have invited Waters & Stanton PLC to be principle sponsors of the National Club of the Year competition. The initiative has been set up by the Society to encourage the membership and growth of Radio Clubs around the country. Each Region will be invited to run it’s own local competition and then each regional winner will be invited to take part in the National Competition. The winning Club receives a £1,000 cash prize, the second place receives £500 and the third place £250. The competition will be held at the Society’s Annual General Meeting. Waters & Stanton already sponsor their local regional competition which was last won by the Chelmsford Amateur Radio Society (CARS) who then went on to win the national prize. 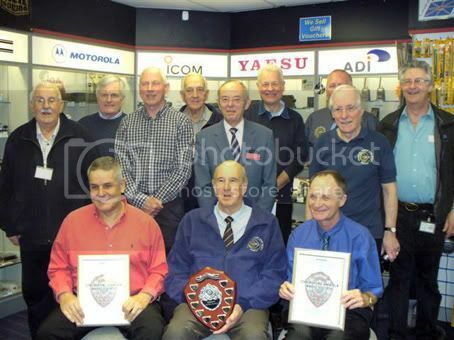 The picture below is of members of CARS receiving their regional prizes from Jeff Stanton, G6XYU at Waters & Stanton premises in March 2010. You are currently browsing the Waters & Stanton Blog blog archives for July, 2010.